Could you please address the correct way to list the locations of births/marriages/deaths? Ten Boer, Loppersum, and Lellens are towns in the province of Groningen. Towns are located in municipalities. Often, the municipality is named after the largest town in its jurisdiction, but not always. One municipality could include dozens of towns and villages. Loppersum and Ten Boer are both towns and municipalities, while Ten Lellens is a village in the municipality of Ten Boer. Municipalities are civil jurisdictions that have existed since 1811. Before that, during the French occupation, there were Departments, and before that the jurisdictions differ greatly for different parts of the Netherlands. Besides the civil jurisdictions, there are also legal jurisdictions (Province > District > Canton), religious jurisdictions (Province > Parish), and cadastral jurisdictions (Province > Cadastral municipality > Sections). The towns and villages where people actually lived would be in all of these jurisdictions at once. You could live in town A, which was part of municipality B, went to church in parish C, and your house was recorded in cadastral municipality D.
Depending on the record, a place name can have different meanings. What is a municipality in one record can be a parish in another record and a village in another. The boundaries of these instances of the same place name may differ, and can also change over time. 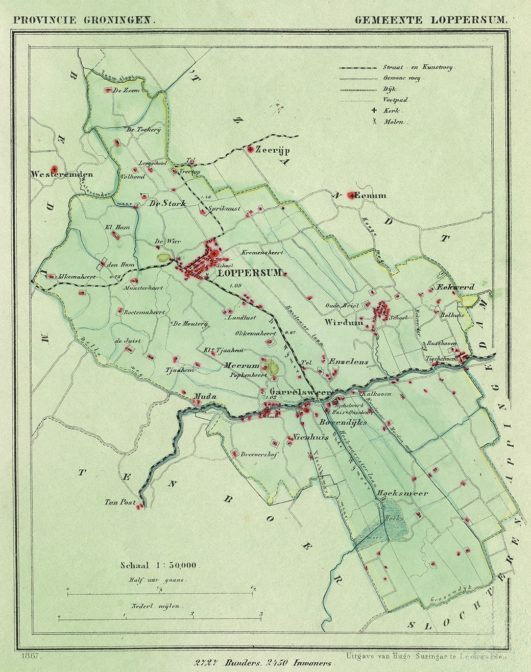 For example, the parish of Loppersum might include a village from a neighboring municipality, and the cadastral municipality of Loppersum might cover territory in several municipalities. Municipalities could merge or have their borders changed, so the municipality of Loppersum in 1812 could have had different borders and included different towns than the municipality of Loppersum today. The Gemeentegeschiedenis website shows how municipalities changed over time. Most Dutch genealogists record the towns where people were born and died as “Lellens” or “Loppersum” without complicating the situation by including the different jurisdictions over time since that information can be looked up if necessary. Some style guides or software prefer listing all the jurisdiction levels, often based on the historical situation, so then you’d have several different entries for Lellens in your place list to reflect the type of jurisdiction and the situation at that point in time. Just a little help for those not used to Dutch….it took me five months to realise that “Elders” is not a place in the Netherlands, but means “elsewhere” – not born or living where the event took place. Great tip! I’ll turn that into a quick tip so more people will read it.